I've noted Half Price Books on the site here before, and I'm sure many readers have stopped in on occasion. But I wanted to take a moment to note what a great store that's become. If you don't happen to have one in your area (they're technically national across the U.S., but not in every state) it's a used bookstore chain. Every book in there was either previously owned or picked up in some kind of remaindered sale from a publisher. Not surprisingly, then, the books are sold at a substantial discount off the cover price. Most of the books, too, are in pretty good condition. Particularly the hardcovers. They've got other stuff as well: records, CDs, DVDs and comics. All generally at a pretty good discount. When I first started seeing the stores about 10-15 years ago, the comics section consisted of 8-10 rows of comics in some wooden boxes that held maybe 400-500 issues in each row. They were about the perfect height for browsing, held up by some shelves that would have maybe a row of graphic novels. They've expanded their selection in recent years, however. The number of comics remains about the same, but they've added an entire section for graphic novels as well. In fact, the store I stopped in this evening had three bookcases of graphic novels and another bookcase of manga. Plus the humor section had an entire bookcase filled with comic strip material, including creator biographies and some of those nice hardcover reprints we've been seeing lately. Now the thing with Half Price, though, is that you can't really make special requests. You can ask a clerk for a specific book and they can see if one of the other locations has a copy but, if not, they can't just call up a publisher and order it. If it's not in their inventory right now, they can't really do anything about it. Which means that hunting for specific books there is kind of a hit-or-miss proposition. But what they do have is an odd assortment of books from people who love books. And that includes stuff you may never have heard about. 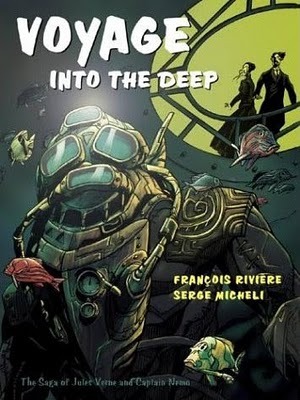 I recently picked up Ho Che Anderson's King, a hardcover graphic biography of Martin Luther King Jr. from Fantagraphics circa 2010, and Voyage into the Deep: A Saga of Jules Verne and Captain Nemo by François Rivière and Serge Micheli, the English translation of which was from Abrams in 2004. Neither of these books I had ever even heard of, but both looked absolutely fascinating. The odds of my stumbling across them in a regular comic shop would be pretty limited, I suspect. Especially now, a few years after their release. Granted, the odds of my stumbling across them in a Half Price Books is pretty limited, too! But when you're browsing their stock, you're (or at least I'm) looking not for any one specific title but rather anything that looks interesting. And there's almost certainly a good chance of finding that!